David Bowie has nothing to prove to anyone - having not just mastered but arguably delivered definitive albums across many genres, from glam rock to funk, soul to ambient. Not only has his music been a constant in my life since I discovered it, but he has been a gateway to so many other brilliant musicians for me. Yet he has returned with new music, which has been met with the warmest of receptions. So can the 'The Next Day' live up not only to the hype but also his classic albums from the 70s? 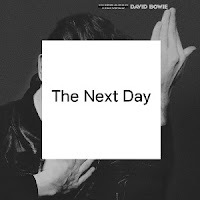 Opening the album is the title track, with Bowie setting out his stall from the off, not only delivering a riposte to those who questioned his vitality but also suggesting there is will be more new music to come - “Here I am/Not quite Dying... And the next day/And the next/And another day”. Instead of sounding like 'Heroes' from which the cover art for the album is adapted, it echoes the sound of 'Scary Monsters And Super Creeps', Bowie’s last truly great album. The track is followed by the sleazy 'Dirty Boys', replete with saxophone, evoking his Ziggy-period. Importantly, these tracks are not merely pastiches of his past great works, providing a thrilling start to the record. However, the record soon loses its focus, drifting perilously close to the comfortable adult-AOR that Bowie has plagued his later works. 'The Stars (Are Out Tonight)' has a nice riff, but it’s pretty safe stuff and it’s only saved by his brilliantly biting lyrics about fame and celebrity culture addicts, “Sexless and unaroused/They are stars, they're dying for you/ But I hope they live forever”. 'Where Are We Now' in the context of the album is almost a palette cleanser, beautifully misdirecting the listener before the glam guitars of 'Valentine’s Day' crunch into action, re-establishing the momentum of the record. It’s followed by 'If You Can See Me' which is arguably the most experimental song on the record. It has a sinister vibe with its urgent drumbeats that rush you along, barely allowing you to cling to the song with the chorus providing only intermittent respite. My favourite song on the record is 'How Does The Grass Grow', with its foot-tapping rhythms, spiky guitars and a chorus that begs you to sing along, and it’s followed by an equally triumphant rocker '(You Will) Set The World On Fire'. In contrast, 'You Feel So Lonely You Could Die' is a wonderful torch ballad that’s of the same pedigree of 'Rock 'n' Roll Suicide', 'Drive-by Saturday' and 'Everyone Says Hi'. It also features same drum-beat outro of 'Five Years' at the end of the song which is a lovely touch. While 'The Next Day' doesn’t quite reach the heights of his classic albums, it’s David Bowie's best record in over thirty years. The way he references his previous works is done cleverly, and the quality of the record means these nods to his past are not misplaced. While the theme of death pervades a number of tracks on the record, Bowie sounds vibrant and the wide array of ideas on this record suggest excitingly there is more to come. Given his back unrivalled back catalogue, Bowie has achieved what seemed a matter of weeks ago unimaginable – he has delivered an album that manages to further his legacy. A thrilling return. 'The Next Day' is available to purchase at amazon.co.uk. Find more info at davidbowie.com.